Win more job interviews with a technically-savvy resume. 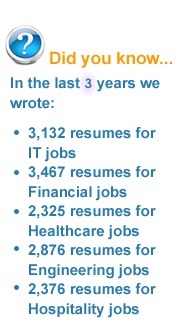 Technical/Engineering and Science-related resume writing for professionals in a variety of technical-related industries. Impress hiring managers and recruiters with a top-notch resume. We are committed to providing you with a results-oriented, accomplishments-based resume that will assist you in closing your next employment offer and advance your career. Services on this page is for customers in the United States. U.S. customers pay no tax on services provided, thus saving 13%. All Prices are in US Dollar. Call 1.877.212.54441.877.212.5444 or email us for a free resume critique.